After their 50 win season in 2004-05, coach Nate McMillan left the Seattle SuperSonics for a well-paying job in Portland. Once that happened, the SuperSonics dropped rapidly to the cellar of the NBA. Averaging more than 50 losses a year for the next three seasons, the Sonics were not looking good. Clayton Bennett, an Oklahoma businessman, took on the challenge and purchased what would become the Oklahoma City Thunder in 2006. Now, Bennett’s team is an elite organization looking to make a push for the first championship in Oklahoma City. Here is a look back to how Oklahoma City has risen from the laughing stock of the NBA to a formidable franchise. The Seattle SuperSonics were lucky to have future Hall of Famer Ray Allen for as long as they did, but after winning 66 games from the 2005-06 season to the 2006-07 season, Allen was ready to move on. The time had come for Seattle to begin the painful process of rebuilding. Rebuilding is generally an elongated process that involves getting rid of well-paid superstars in favor of draft picks and younger talent. Many teams have problems with this process—it is a struggle. A rebuilding team needs to get good draft picks and the right balance of talent and chemistry. Just look at the Golden State Warriors and Charlotte Bobcats, among other teams that haven't drafted well to get the rebuilding process jumpstarted. Many people didn't think an improvement for the Seattle/OKC organization would come for a long time, but with a little bit of luck in getting good draft picks, the Thunder would rise farther and faster than anyone could have predicted. Nobody has drafted better than Oklahoma City. In 2007, the Thunder drafted Kevin Durant, a pick that was then a risky pick at number two. According to NBC Sports, Durant was unable to bench press 185 pounds and was slower than the seven-foot big man who was taken with the No. 1 pick (Greg Oden). Three scoring titles later, I think it’s fair to say that OKC is happy with its pick. The very next year, the Thunder had the No. 4 pick after a 60-loss season. With it, they grabbed UCLA star point guard, Russell Westbrook. He may not be the best complement to Kevin Durant, but he has certainly emerged as an elite NBA player and a major reason why OKC is a premier team. Later in the first round of that draft, OKC picked a big man from the Congo, Serge Ibaka. A raw talent at the time, OKC has nurtured the player his teammates call “Air Congo.” In 2012, he finished ahead ofOrlando superstar Dwight Howard in voting for Defensive Player of the Year. How did the 2009 draft go? Oklahoma City landed the No. 3 overall pick and selected Pac-10 Player of the Year, James Harden. The basketball version of “Fear the Beard” has become an aggressive scorer and would be a primary or secondary option on most other teams. He won Sixth Man of the Year Award in 2012. In all honesty, can you do it any better? Three of the Thunder’s five starters were drafted by OKC. Maybe Charlotte owner Michael Jordan will hold out hope for his Bobcats because Oklahoma City is proof that you can create a great team if you draft the right prospects. Nate McMillan looked like he had Seattle headed in the right direction. But he followed the money and left for the Trail Blazers in ‘05—ironically, the team would draft Greg Oden over Kevin Durant. Over the next four seasons, the Thunder hired and fired three coaches (Bob Weiss, Bob Hill, and P.J. Carlesimo). None of those coaches won half of the games that Seattle/OKC played under them. In 2008, the Thunder front office promoted assistant coach and former NBA point guard, Scott Brooks. Originally only an interim coach, Brooks has become one of the league’s best coaches, which is validated by his deep playoff runs the past couple years and the 2009-10 NBA Coach of the Year Award. Anybody who was worried that Oklahoma City was no place for basketball has been proven completely wrong. The deafening roar at Chesapeake Energy Arena is one of the loudest in the entire league. No team wants to go to the arena that houses the team with the third best home record behind onlyMiami and San Antonio. 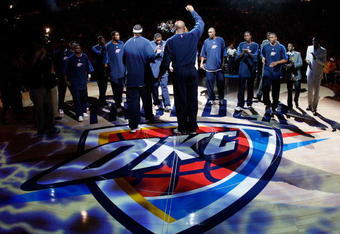 With no other major sports franchise in Oklahoma City, the fans there live and die by their Thunder. The energy combination of the young OKC players and their diehard fans is an extremely difficult proposition for any visiting team to overcome. No current coach has been in the NBA longer than the San Antonio Spurs' Gregg Popovich. So when someone of Popovich's stature—two-time coach of the year and four-time NBA champion—says that a team is a "championship team," he isn't joking around. That is exactly what he said in post-game interview about the Thunder. Kevin Durant and the Oklahoma City Thunder have beaten the Dallas Mavericks and Los Angeles Lakersin the playoffs this year—the two teams that won the NBA championships the past two years. They look to add the San Antonio Spurs to that list in the Western Conference Finals. If they go on to win the championship (which isn't too much of a stretch anymore), they will have beaten four of the top teams in the league. It'll be the ultimate culmination that OKC has done it right. If OKC does not win, they still have many, many more opportunities. The members of the "Big Three" in OKC are all 23 years of age or younger. They have made it from the bottom of the NBA to the elite. View this article on Bleacher Report here. NBA Finals 2012: Will the Next Great Coach Arise?